Joseph B. Hilario was born on September 15, 1990 in Evangelista, Naujan, Oriental Mindoro. He studied in Nueva Viscaya State University with a major in Drafting. 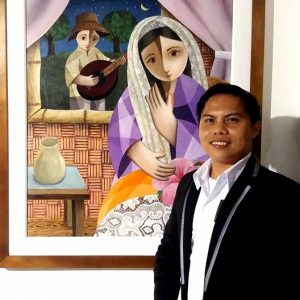 Inspired by a mix of Malang’s works, traditional and cultural ones, as well as ordinary life, his style focuses on illusionism and cubism, in which he uses acrylic on canvas as his choice of media. His subjects are what he calls “panunuyo” where his art depicts affection that captures people’s feelings.